Not to jump the gun, but November will be here very soon. Might as well get this thread going. I encourage everyone to play games actually developed by Natsume, not just published by them. In that regard, here is a list of games developed by Natsume: Holy hot mama that's a lotta games! There's plenty more good stuff where that came from. I hope others will throw some solid rec's out there as well. With so many options to choose from, this should be a very inclusive, very fun month. I have my sights on Ninja Warriors (SNES) and Wild Guns (SNES), two SNES fan favorites I've played a little but never finished. I wasn't a fan of Cabal-style shooters before, but after playing some Cabal and Blood Bros, I'm amped for Wild Guns. I've also warmed up a bit towards single-plane beat-'em-ups in the last two years, so it's time. I've also been thinking about trying Natsume's second game ever, the recently fan-translated NES graphic adventure Idol Hakkenden. I've been playing action games nonstop for a while and it seems like an adventure game would be nice, though I don't know if the Idol theme will put me off or what. Finally, their action platformer I'm most interested in Mitsume Ga Tooru (NES). I've been playing a lot of side-scrollers and action-platformers, though, so I don't know whether I'll be in the mood this month. For anyone looking for a beat-'em-up, I have two recommendations. Renegade (Master System) is a fun, Technos-style beat-'em-up in the mold of Double Dragon and the Kunio-kun games. 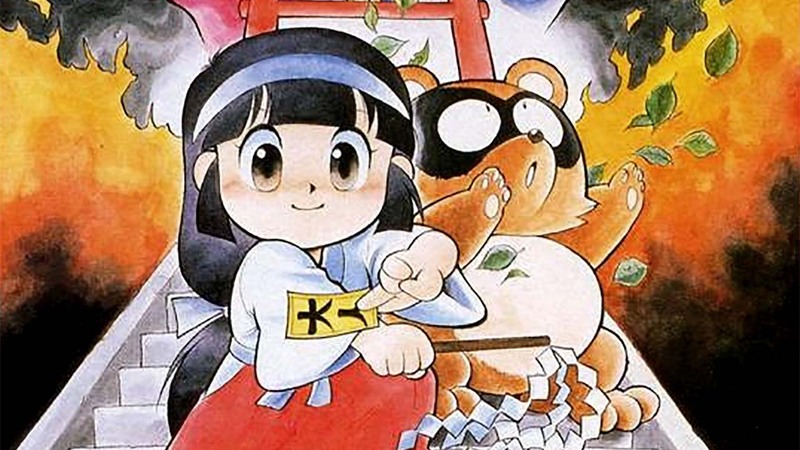 The NES version is widely hated, but Natsume remade is for the Master System in 1993, and it plays a ton better. It's a pretty well-kept secret, it seems. Check it out. Hokuto no Ken: Seiki Matsukyu Seishi Densetsu	(PSX) is a great 3D brawler, with a few more moves than usual, some defensive game, and QTE-style finishing moves. You also get to make people's heads and bodies explode all over the place. Only problem, though, is that you cannot skip the Japanese cutscenes unless you're replaying a chapter you've already completed, and they're quite long. If that's too much for you (although the scenes are still pretty cool), gamefaqs has a save game file you can load in an emulator that'll let you replay through the game and skip them. Also Hokuto no Ken has "You wa Shock", the greatest theme song ever, dammit. These are the main ones I plan to focus on, all NES action games. 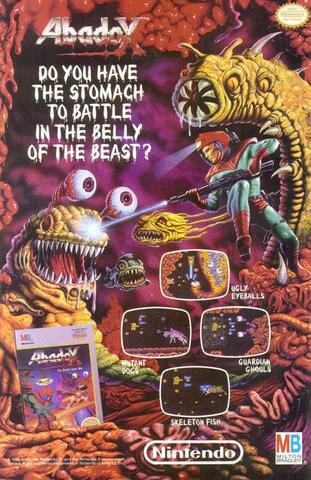 Abadox is an R-Type styled shmup with checkpoints... which I don't love (checkpoints instead of instant respawns with limited lives), but it looks awesome so I want to give it a shot. I beat The Ninja Warriors earlier this year myself and it was awesome, but the final boss was extremely annoying and I used save states. 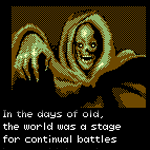 It's just a few minutes into November, EST, and I have finished Idol Hakkenden (NES, 1989). It's a very atypical game for Natsume; a graphic adventure about a young girl named Erika who has three months to become successful in order to earn her dying mother's inheritance. As singing is her only talent, she sets out on the path to stardom. The term "Hakkenden" is a reference to Satomi Hakkenden, a famous 19th century Japanese novel in which 8 companions come together to defeat an evil witch*; similarly, Erika recruits a posse of 7 girls along the way, each with their particular talent or specialty, and eventually faces off with the Kooky King, "the dark side of the entertainment industry", who wants to turn the entire world population into goofy comedians. It also has disgraced Olympic runner Ben Johnson in a leopard suit. In order words, this isn't the most serious of games. That's what saved it for me; the cutesy aspect annoyed me, but I figured it'd be short enough that I might as well put up with it. It picks up in the last two chapters, with some funny moments and everyone coming together for a frantic text-based, menu-driven battle. The music's also pretty nice. The game's about... 3 hours long, I'd say? I got stuck twice, but not for too long, since like most games of its type, trying every possible option will let you advance when logic no longer works. I'd give it **. I'm clearly not the target audience, though. I actually played a little bit of that a few nights ago. Was thinking about it for this month. toei - Yeah I don't think that particular game is up my personal alley. Thanks for the info on it though. I have played all of these before, but I have never beaten any of them yet. If by some miracle I get through all of those before the month is out, I may add more Natsume love to the pile. Sarge and I have both beaten Abadox before. I think he and I agreed it's like a 6/10. I think of it as a poor man's Life Force. It's worth a run though. 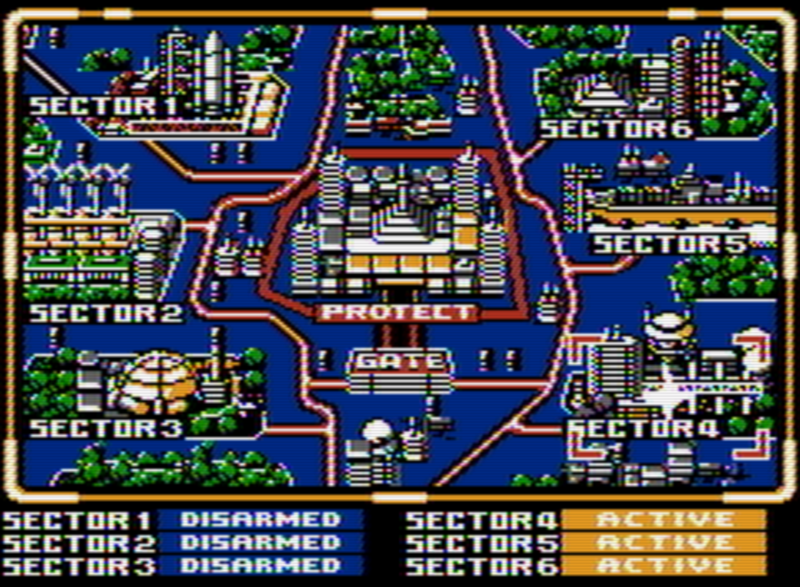 I've disarmed half the sectors (beaten half the levels) at this point. Thankfully this game supports passwords! I assume there's going to be seven levels though, not six. Definitely solid stuff thus far. As long as I live I doubt I'll ever get tired of the glorious NES. If no one has mentioned it, there's also Choujin Sentai Jetman. While it's not Shatterhand-level, it's still a solid game with some great tunes. "Power Blade" is a platformer developed by Natsume, and published by Taito Corporation, in the USA of 1991. This game was later released in Europe in 1992. "Power Blade" is actually a reworking of a Japanese-only Famicom release called "Power Blazer". Many changes were made between "Power Blazer" and "Power Blade", and from what I've read, all for the better. 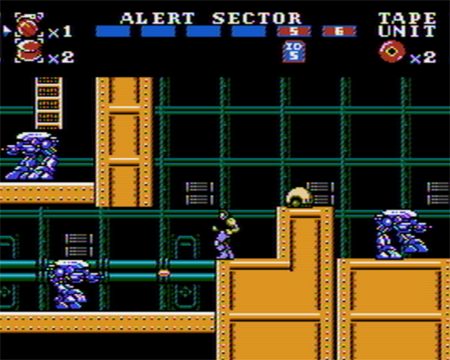 In "Power Blade" the player acts as a government agent named Nova. (Nova's key ability is a powerful boomerang weapon.) In Nova's world, a powerful computer runs the city. Aliens hack the computer and make it start attacking the city, locking down six access servers in the process. Nova must track down ID cards to access the servers, unlock and repair them, then take down the alien overlord in the computer's master control room. 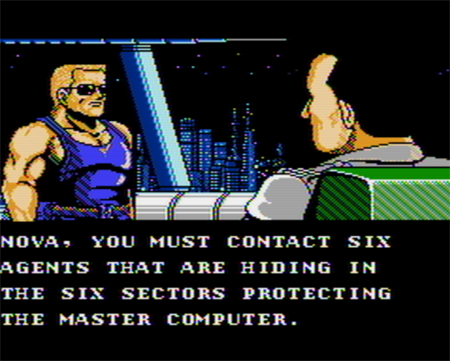 The ID cards are stored in six different sectors (levels), held by contact agents Nova must find. Each server is also protected by a boss Nova must defeat. 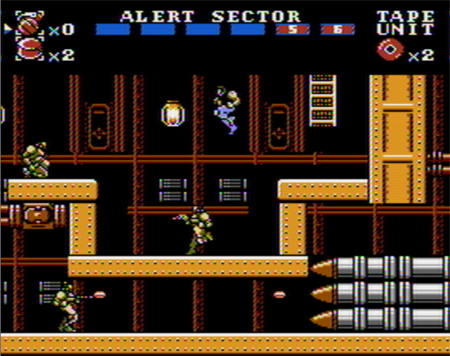 The sectors are full of enemies and platforming hazards. That's the gist. +Fun mish-mash of "Mega Man" and "Castlevania" influences. +Password system for saving progress. -Not original in any aspect. -Wears its influences a little too obviously. -Backgrounds could use some animation. -Low difficulty level (bosses are a joke). Due to its simplicity and low difficulty level, "Power Blade" would have made for a great rental back in its day. The only real challenge in this game are its maze-like levels. 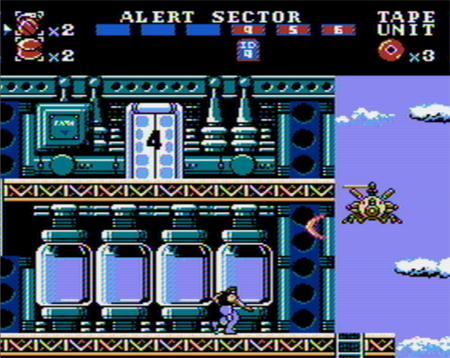 That is to say the levels are non-linear, as the player must track down a key, and then track down the boss door to use the key on. (This is only true for six of the seven levels.) I'm not personally a fan of maze-levels in traditional platformers, I prefer linear designs. But "Power Blade" was breezy enough that I still enjoyed its gameplay despite the non-linear layouts. 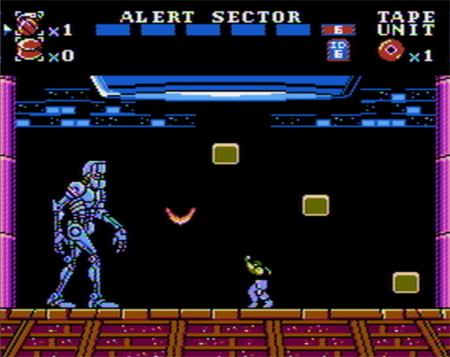 The NES is not short on futuristic platformers that allow the player to jump around and shoot. Against its respective platform's library of said genre, "Power Blade" manages to reside in the upper region of that legion. For all "Power Blade" lacks in originality and challenge, it makes up with competent controls and tonal consistency. Just running and jumping, climbing ladders and shooting aliens to pieces, collecting power-ups - that kind of stuff is pure classic retro fun. "Power Blade" is from that era where a blonde dude with sunglasses tossing boomerangs at robots was good enough. Twenty seven years later it still is. Seems like everybody (well, out of the few who've joined this thread so far) is playing Power Blade this month. I might just end up jumping on that bandwagon.